As the clock counts down ahead of next Monday’s Championship play off final, nerves will be starting to kick in around both the Crystal Palace and Watford camps. Crystal Palace, were a team at the start of December looking to take the automatic promotion route along with league winners Cardiff City. After their match on December 1st, they sat top of the Championship table 2 points clear of Cardiff. But from that win, things started to go wrong for The Eagles. A vital loss against Cardiff on boxing day proved to be a turning point leading to wins turning into draws, and some losses against the likes of Sheffield Wednesday, Brighton, Birmingham and Ipswich saw them eleven points off of the two automatic places. With Wilfried Zaha loaned back to Palace after a transfer to Premier League side Manchester United in January, he proved to be a vital part of Crystal Palace’s push for the play offs. With four games to go they needed some kind of miracle to take Hull City’s second place. But with three draws and one win out of their last four games, saw them take a play off spot, finishing fifth. 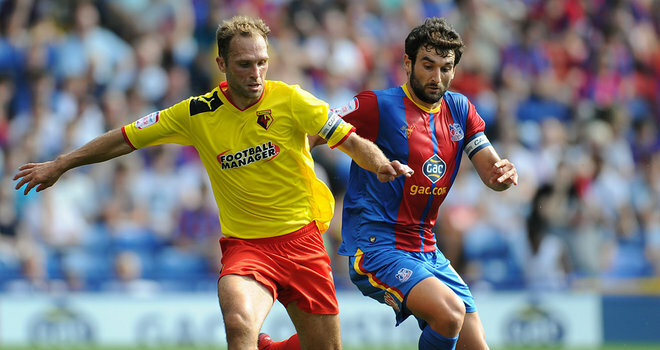 Watford, Crystal Palace’s Play Off Final opponents, were a surprise package this season. Led by Gianfranco Zola, he took Watford to sixth place at the end of December. Goal machines Matej Vydra and Troy Deeney, along with talismen Almen Abdi, Fernando Forestieri and Nathaniel Chalobah proved to be vital for Watford’s promotion push. Two months after Boxing day, The Hornets proved a real problem as they stepped up their chase for the top two. They sat third, one point behind second placed Hull City. This left one game left for Watford to take second spot. But for this, they had to better Hull City’s result against league winners Cardiff City. Watford went 1-0 down, but three minutes later levelled the score when Almen Abdi scored for the Hornets. Watford had to kick on now. At half time both games were level at the break, at this point Hull City would be promoted. Hull fought back in their game to take a 2-1 lead against Cardiff, which meant no matter what the Watford score, they would be promoted. Hull had the chance to take a two goal lead with a late penalty, but it was missed by Nick Proschwitz. Cardiff went up the other end and won themselves a penalty, which was converted by Nicky Maynard. With Watford’s game having around 16 minutes in first half injury time, this left their game finishing late after Hull City’s. Watford fans knew of the score and encouraged their team forward, ending in a Leeds counter attack and Ross McCormack chipping young goalkeeper Jack Bonham. This saw Watford have to settle with a play off spot, and Hull City would take the final automatic promotion place. Crystal Palace and Watford still had much to do. 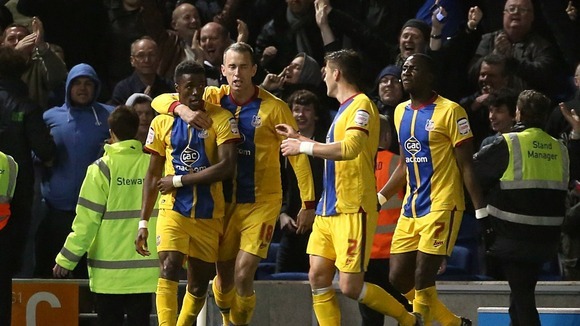 Crystal Palace faced Brighton at Selhurst Park in the first leg, which saw no goals. The second leg at the Falmer Stadium proved different, with an on form Wilfried Zaha scoring two goals to send The Eagles to Wembley. Watford faced Leicester City, who had scraped their way into the play offs on the final day. The first leg at the King Power stadium saw a late David Nugent goal give Leicester a 1-0 lead going to Vicarage Road. The second leg was a different game. In the fifteenth minute, Matej Vyrda scored an outstanding first time volley to give Watford the lead. That lead only lasted four minutes, with again David Nugent scoring. Vyrda scored again 20 minutes into the second half, to level the scores on aggregate, (remember away goals do not count). But Leicester won a cheap penalty in the last minute of the game, a goal would surely see them promoted. Anthony Knockaert stepped up for Leicester but Manuel Almunia made a tremendous double save to keep Watford in it. Watford performed a Doncaster like counter attack, and Troy Deeney sealed the win with a powerful volley. So, Monday looks to be a thrilling game with plenty of action. But will it be The Eagles or The Hornets who take a huge step into the Premier League with Cardiff City and Hull City. Leave your comments below on what you think will happen! Be sure to follow The Football Family for all the latest Championship Play Off news and updates.